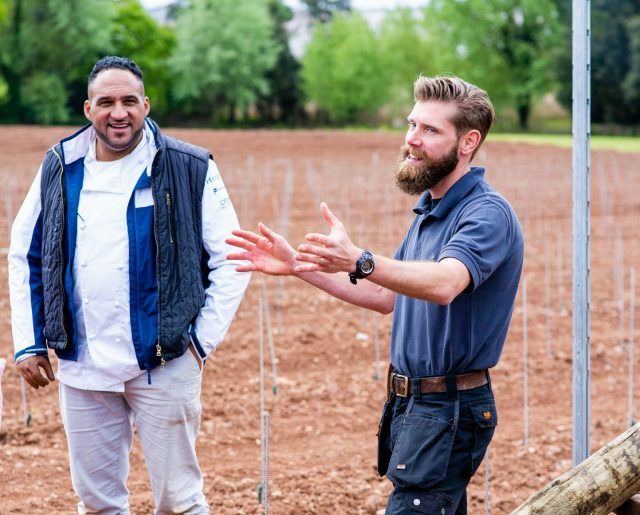 Chef and owner of Michelin-starred Lympstone Manor, Michael Caines MBE, and manager of the hotel and restaurant’s new vineyard, James Matyear, discuss their English wine production plans, and why we could start to see more single vineyard expressions and clarity over regional labelling in the future. Caines and Matyear announced plans to plant a vineyard at the country house hotel and restaurant in Devon in March. With planting delayed due to significant snow fall, frost and then heavy rainfall, the team eventually planted 17,500 vines in May with a projected first wine release date of spring 2024. The vines, planted over 4.2 hectares and comprising 50% Pinot Noir, 30% Chardonnay and 20% Meunier, will be used to produce “classic Champagne-method sparkling wines” as well as still wines that will be sold and served at Lympstone Manor and potentially further afield. Here, former Gidleigh Park head chef Caines, and Plumpton trained, ex-Hattingley Valley Matyear, discuss their plans for the vineyard, why Devon is suited to grape-growing and what the future holds for English wine. What was it in particular about the site that inspired you to establish a vineyard? Caines: I have visited vineyards around Europe and have always had a great interest in wine and the effects of their environment on the finished product. 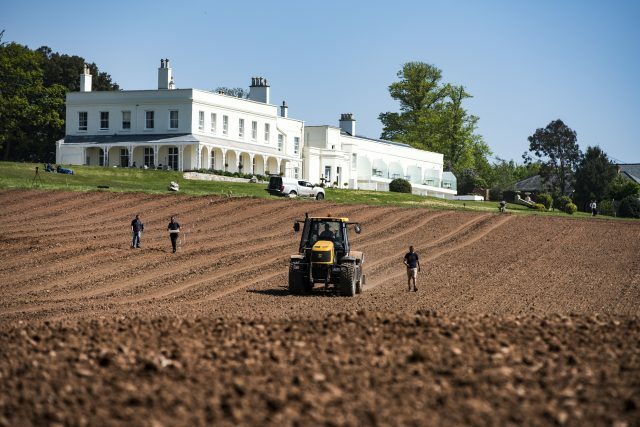 When I embarked upon the Lympstone Manor journey and saw the landscape of our plot, it was just instinctive to want to plant a vineyard of our own. We have a perfect south facing plot with great exposure, perfect slopes, low altitude, it really couldn’t be a more idyllic spot. How many wines will you be producing? Caines: We will start off producing sparkling wines in a house style and perhaps a rosé and as we progress and develop our process and our vines get more established, we may look into producing single grape varieties, possibly a blanc de noirs or a blanc de blancs, and even some still wines, but we need a good yield for the best return and so we will have to work around our process and our fruit. How many bottles do you think you’ll produce each year? Matyear: This is of course very much subject to many factors, but assuming an average yield at full maturity, we should expect to produce approximately 20 to 30 tons of fruit. This should allow us to make approximately 20-25,000 bottles of wine. Do you have an idea of the style of wine that you’d like to make? Caines: It is hard to say at this stage as we are still so early into the project. We will be having a tasting of English sparkling wines and Champagnes soon, to see what style of wine we all like and hope to achieve, but depending on the yield and the quality of our fruit, it is difficult to comment just yet. It is safe to say, however, that with such a high percentage of Pinot Noir being planted, that this is likely to be more dominant factor in the final product and as time goes on, we will look to create a consistently good house blend which we hope to rely on the success of year upon year, holding back reserve stock as we go. What soils do you have in the area? Caines: We have a red Devon clay, pebble bed and Triassic bedrock. This should provide us with great minerality. Matyear: Our soil profile is predominantly that of a clay loam, which provides us with a nice structural balance, allowing us to retain nutrition, whilst providing us with good drainage. This is further assisted by the vast amount of river bed stone which sits above a bedrock layer of Exmouth sandstone, dating back approximately 250 million years ago in the Triassic period. What events do you have planned around the vineyard and the wine you’ll be producing? Caines: We have already had a successful vine panting event and we will look to create further events across the annual calendar and throughout the process that help to educate people and make our vineyard something to be celebrated at various points in its growth. We will be mapping out our process and aligning events with this as well as offering both residential and non-residential packages twice a week which will be exclusively vineyard packages. We are also looking to host a harvesting festival and this will be a recurring event that wine novices and experts alike will be able to come together to enjoy. We will also be building wine events with our wine making partner, and more details of the partnership will be announced shortly and hosted on our website. What has been the most surprising thing that you’ve found out since you started this project? Caines: Luckily, so far we have had only good surprises. We have found that our vineyard sits in the top 5% of micro climates in the UK for growing vines, add to this that the highest spot in the vineyard is only 22 meters and that we have a single vineyard status, then it really is very lucky and special to be able to plant in such a spot. We feel very lucky to have a similar microclimate to that of Nyetimber and with it needing to be so specific, we really hope to be able to use it to its full potential. What advantages do you believe that Devon has for growing grapes, and what are wine producers in the county doing differently? Caines: I think what Devon has is more of an opportunity now to play its part in that story. We need to be careful where we plant as the climate has to be just right and this will restrict our yield, however it allows us to concentrate more on the quality of wines, rather than vast quantities. We are lucky to have some top producers in the country such as Sharpham Estate, Pebblebed, and Lyme Bay which are all great leaders and we are seeing more producers rising up in the domestic market such as Kenton Estate and Old Walls Vineyard, to name just a few, so we are really in quite an exciting time for English wine at the moment. Am trying to get hold of James Matyear -anyone got any ideas?